This brass polyhedral dial of irregular shape is very finely engraved with foliage and figures. 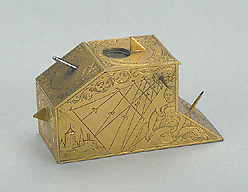 The top face has a very small compass, with a card marked 'OR' and 'OC', and a dial with solid polar gnomon, indicating common hours from 4 to 12 to 8. The spandrel spaces are decorated with foliage. The north reclining face has a pin gnomon dial indicating common hours from 4 to 12 to 8, and decoration of foliage in the spandrel spaces. The steel pin is a later replacement. The north face has a solid gnomon dial indicating common hours from 4 to 8 twice, the initials '[star] W [star] S [star]' and date '[star] 15 [star] 53 [star]'. According to E. Zinner, in his Deutsche und Niederl?ndische astronomische Instrumente des 11. bis 18. Jahrhunderts (Munich, 1957), these are the initials and date of the maker. The south vertical face has a dial with solid polar gnomon, indicating common hours from 6 to 12 to 6 and foliage decoration on the bottom. The south reclining face has a pin gnomon dial indicating Italian hours from 13 to 24 and common hours from IIII to XII to VIII. The symbols of the zodiacal signs of Libra, Capricorn, Aries and Cancer are engraved on the appropriate lines. The west face has a pin gnomon dial indicating common hours from 2 to 7 (p.m.) and Babylonian hours from 10 to 15. The bottom part of the plate is engraved with a figure of a woman holding a dog, a town landscape and foliate decoration on the top. The east face has a pin gnomon dial indicating Babylonian hours from 1 to 6 and common hours from 5 to 11 (a.m.). It is engraved with a figure of a man with a dog, a landscape in the foreground and foliate decoration on the top. The bottom face has the name and date engraved on a cartouche 'SIMON SCHMIDLKOFER DER IVNGER ?1 ? 5 ? 7 ? 7 ?'. According to Zinner this refers to the owner, not to the maker. The instrument was bequeathed by Maurice Rosenheim in 1922 and is described in F. A. B. Ward, A Catalogue of European Scientific Instruments in the Department of Medieval and Later Antiquities of the British Museum (London, 1981), p.32, no.64.